These are my eats from last Wednesday. Before we even get started, let me say that I have no clue what was happening this day. All I wanted to do was eat food. Every second. My day at work was also incredibly busy – so I didn’t have much time for eating, but every time I had a two second break I wanted a full meal to eat. Oh food. 6am-ish – Breakfast Here is the thing. All week I wanted peanut butter and jelly sandwich – but didn’t have bread or jelly, and yogurt with strawberries, but didn’t have yogurt and strawberries. 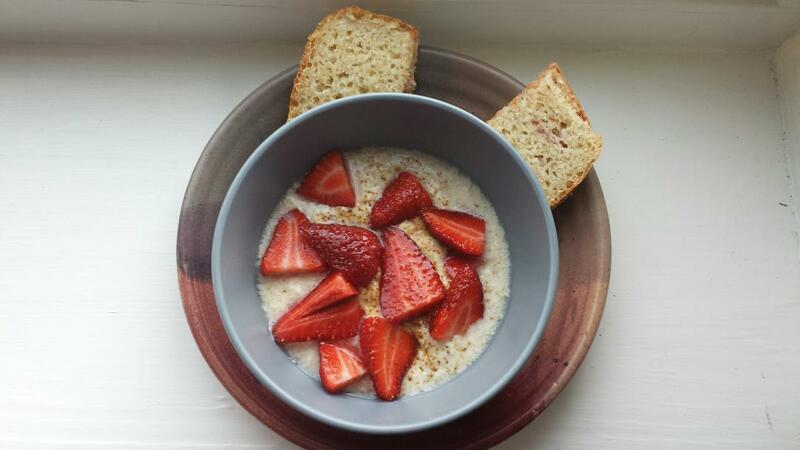 On Tuesday, I finally corrected the problem, and made bread and (vegan) yogurt, and bought strawberries and jelly. Happy Breakfast. Happy Tummy. — Peanut Butter and Jelly on rice bread and vegan yogurt with coconut sugar and strawberries. 1230ish – Lunch, part 1 We had a catered lunch at work. 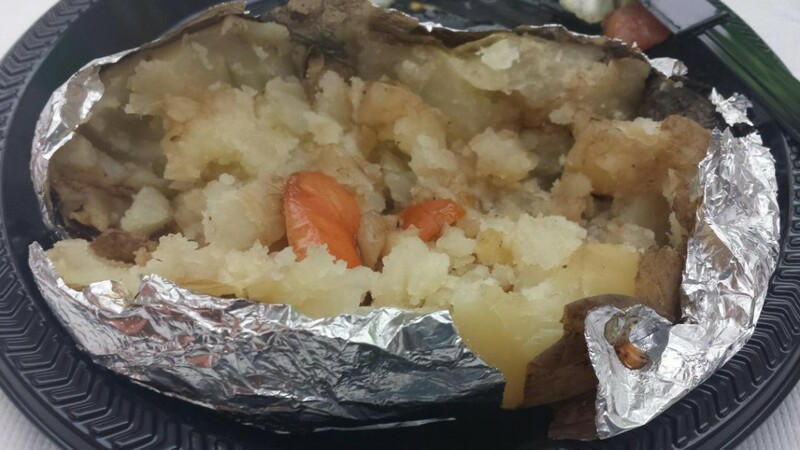 I couldn’t eat the main dishes (grilled chicken and pasta) – but the baked potatoes were HUGE and amazing. And, they had salad. And balsamic dressing. So lunch (part 1) was a baked potato with tomatoes from the salad and balsamic dressing on the potato, then salad on the side. <Free lunch is always awesome. Repeat of lunch part one, with the leftovers from the catering. It was even uglier than the first potato. So I didn’t photograph it. 445pm – ish – Uhm. Late night working snack number two. 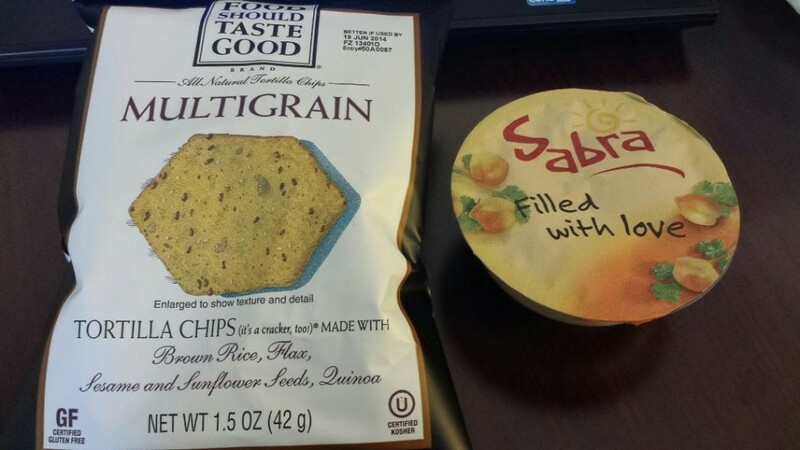 (I worked until almost 8pm) Multigrain tortilla chips (love love love this brand), and some “classic” hummus. Another cafeteria find. This hummus comes packaged with pretzels (+gluten) – so I buy chips to go with it. I so love hummus. 830-9pm – ish. Dinner. Finally. I was still so incredibly hungry when I got home, that I kept getting food out and putting it on my plate. Roasted sweet potatoes, white potatoes (what was with the potatoes today?! 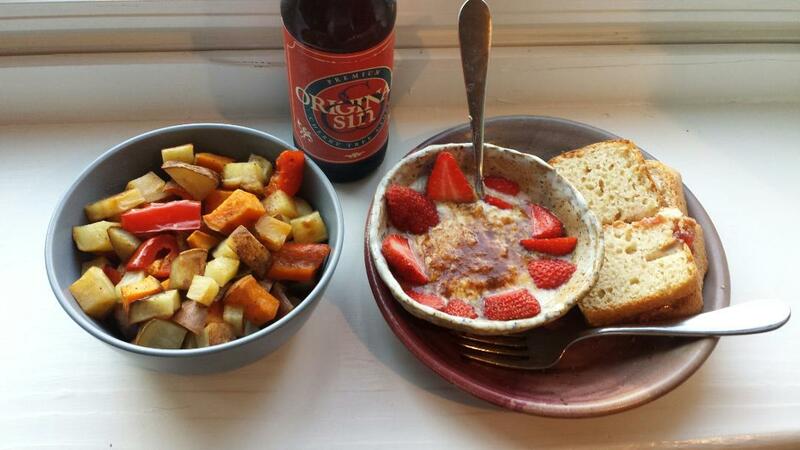 ), bell peppers, onions and garlic, yogurt with strawberries and coconut sugar, and…another pb&j on rice bread. Oh. And a tart cherry cider. <Yep. That kind of day. I also had thought about eating an entire bag of Earth Balance Vegan puffs, but I forgot to grab them when I sat down to eat, and then was too tired to get back up. After eating this dinner I promptly fell asleep, because I had to be back at work at 630am. Oy. Long week. So – those were my eats (last) week. Intense hunger. Lots of foods. Super busy day. I hope everyone is having a great week! You can click here to see other Wednesday Eats, and I’ll see you tomorrow for Thinking Out Loud Thursday! Choices at work are so limited, especially when you have to work late! Good job making the best of it. Happy WIAW! Thanks!! 🙂 🙂 Happy WIAW! Potatoes are just SO good. I got a huge bag [think: 5.5 lbs ] of them last week and now have to make sure to eat them before they go bad. Seriously, though, why they don’t sell smaller bags of starchy potatoes is beyond me. On another note your dinner looks awesome. A little bit of everything – savoury, sweet, roasted, fresh. Perfect combination.